Methylphenidate (Ritalin, Concerta, Daytrana) is one of the most common stimulant medications prescribed for ADHD. However, there have been several questions as to its side effects. Studies have been conducted on the effects of methylphenidate which include excessive talking, cardiac abnormalities, hallucinations, bruxism (teeth grinding), movement disorders, psychotic and manic-like symptoms, appetite suppression, and temporary weight and growth reduction. Please note, however, that this list above is not meant to scare anyone off of this medication. While some side effects appear to be relatively common and well-grounded (such as appetite suppression and temporary growth impairment), many of these side effects are relatively rare, and the results are often based on isolated studies with poor reproducibility. To be fair, methylphenidate has been subject to a number of tests, with the vast majority supporting the claim that it is a relatively safe medication (provided one uses it appropriately as prescribed). Furthermore, previous entries of this blog have dismissed the notion that methylphenidate carries an addiction potential on the level of cocaine or illegal amphetamines (a claim often erroneously made by many of the anti-medication crowd. Keep in mind that I personally do share many of the same concerns of these groups, but likening a controlled prescription drug with multiple addiction-reducing features to illegal street drugs is both irresponsible and does the overall argument on ADHD medication concerns a disservice in my opinion). Nevertheless, some of the above associations, while limited in scope and supporting data, do seem intriguing. For this post, I would like to briefly assess the results of the first unusual side effect of methylphenidate on the list, the surprising link between methylphenidate and excessive talking. Before we proceed, we must bear in mind that this association is based on a single case report, and not a controlled clinical study. For those unfamiliar with the differences between the two, a case report is essentially a report of one (or a few) individuals, who exhibit particular symptoms, often in response to a particular medication or treatment strategy. While these reports lack the statistical power and overall scientific magnitude when compared to tightly-controlled clinical studies involving large sample sizes, we should not be quick to dismiss these findings. Individual anomalies, while often statistically small, do offer insight into some of the idiosyncrasies of medication and other forms of treatment, and involve real individuals (who are often in a more "natural" setting than those in clinical trials). Given the recent advances in genetic studies and innovations in imaging and computational power, we appear to be at the dawn of a medical revolution, in which medication and treatment plans are becoming increasingly tailored towards individuals rather than groups or the general population. I personally believe that because of this general trend, individual case studies will begin to carry more weight and validity among the medical community than they have previously. The case involves a 5-year old Iranian boy who was prescribed methylphenidate (10 mg per day) for extreme hyperactivity and impulsive behavior, two key symptoms of ADHD. Treatment with this dose of methylphenidate produced significant improvements in both impulsivity and hyperactivity. Approximately 45 minutes after taking the medication, both parents and teacher reported a sharp increase in excessive talking. These results continued for 3-4 hours, which approximates the duration of effectiveness of methylphenidate (immediate release formula). Most interestingly, perhaps, was the apparently direct association between methylphenidate intake and hyper-talkative behavior. The study reported that methylphenidate treatment stopped and was reintroduced on over 20 different occasions within a 7 month period. In all 20 plus cases, the hyper-talkative behavior resumed when methylphenidate treatment was reintroduced. The magnitude of the difference, between talking behavior on and off the medication, while subjective, was significantly pronounced. On a 1-10 scale (done by parents and teachers, with 10 being the highest), the child's talking was around a 2-3 when off the medication and a 7-9 while on it. This extremely high frequency of association and pronounced behavioral differences between methylphenidate and excessive talking strongly attributes the abnormal behavior to the medication. The study gives several potential explanations for this association between behavior and medication. For example, methylphenidate, which regulates free dopamine levels and dopamine-related neural function, was shown to regulate word production in individuals with schizophrenia. Additionally, methylphenidate has been used to restore talking in patients treated with anesthesia. Finally, methylphenidate has been shown to effect the striatal region of the brain (see below, original file source here), which has a regulatory effect on cognitive motor functions, including talking patterns. 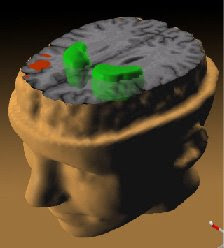 The striatum region of the brain (shown in green in the figure above), which has been shown to have a response to methylpenidate, and may be an underlying reason for the connection between methylphenidate and excessive talking. As mentioned above, we should obviously not put too much stock into one case study on the potential connection between the unusual side effect of excessive talking in response to methylphenidate. However, based on the severity and consistency of the association for the individual and the underlying theoretical basis of the association based on the results of other studies, we should not overlook the observations of this particular study. Furthermore, given the effectiveness of methylphenidate for reducing hyperactive and impulsive ADHD symptoms for this particular child, the fact that excessive talking behaviors (which can be a sign of ADHD-based impulse control problems) suggest the possibility that the methylphenidate treatment may have an effect on shifting the outward expression of symptoms of an underlying ADHD condition such as impulsivity. As a result, a number of questions should be raised on the basis of this study. Can you give your opinion about a new alternative way to treat ADHD (using 2 supplements; EPA fish oil and phosphatidyl serine or lecithin)? I have been on this particular methylphenidate dose (10mg t.i.d) for a few weeks and have noticed that occasionally I'll go and on more than usual, but in a slightly driven, pleasureless way. It feels a bit strange. I do feel less restless on it, but not less impulsive, in fact probably more so. Perhaps restlessness and impulsivity plus increased focus leads to motormouth syndrome. My son and I have the exact same reaction to this drug. What does this mean? This happens to my son who is usually quiet. On medication he just talks and talks, often repeating himself. Off medication, he has the attention deficit but not really the impusivity or hyperactivity. I wonder if the excessive talkingt is the result of over focussing on a subject matter? We started my son on Ritalin yesterday. We noticed nothing out of character after his first dose, but he talked for three ours straight after his second dose. And this is a kid who replies "I don't want to talk about it" to most normal conversation. Literally. Talked. For. Three. Hours. Non-stop. I came across through your blog. I really found the valuable information.